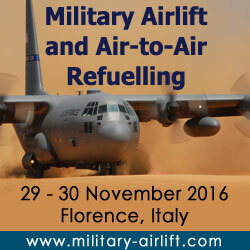 SMi’s Military Airlift and Air-to-Air Refuelling conference is the largest bespoke military airlift conference in Europe. Now in its 17th year, this two-day event will provide a comprehensive overview of strategic and tactical airlift in Europe, along with presentations from further afield. The two-day programme will also feature presentations on military logistics, humanitarian response and vertical helicopter airlift, which will be addressed by the major militaries and the multinational commands.